Separate dough into 8 biscuits; separate each into 2 layers. Stretch each layer into 4-inch round. Top 1 dough round with 1 graham cracker square. Top graham cracker with 6 to 7 marshmallows and 6 to 7 chocolate chips. Cover s’more filling with another dough round; press around edge to seal. Repeat with remaining dough rounds, crackers, marshmallows and chips. Place 1 filled biscuit on waffle maker. Close lid; cook 2 to 3 minutes or until golden brown. Repeat with remaining filled biscuits. Serving immediately. 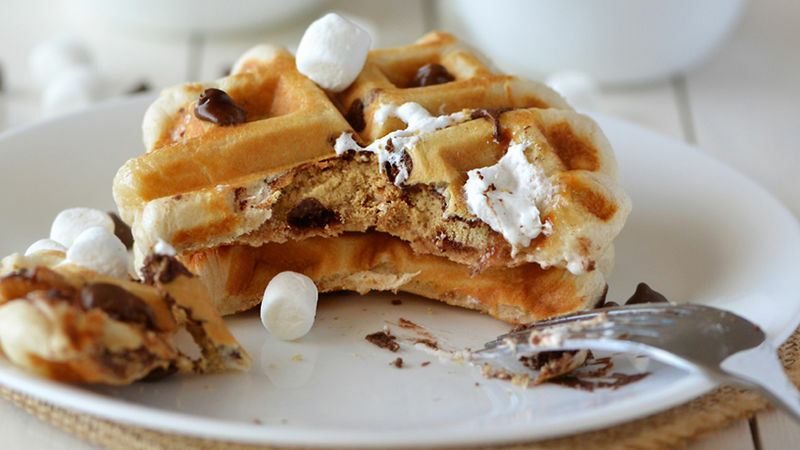 Serve the s’mores waffles with extra marshmallows and chocolate chips on top. Try white vanilla or semisweet chocolate chips for a different flavor.